A spontaneous sit-down protest in front of an airport-bound deportation coach may have won enough time for a last-minute High Court ruling, which cancelled the enforced removal of about 40 ‘failed’ Tamil asylum-seekers. 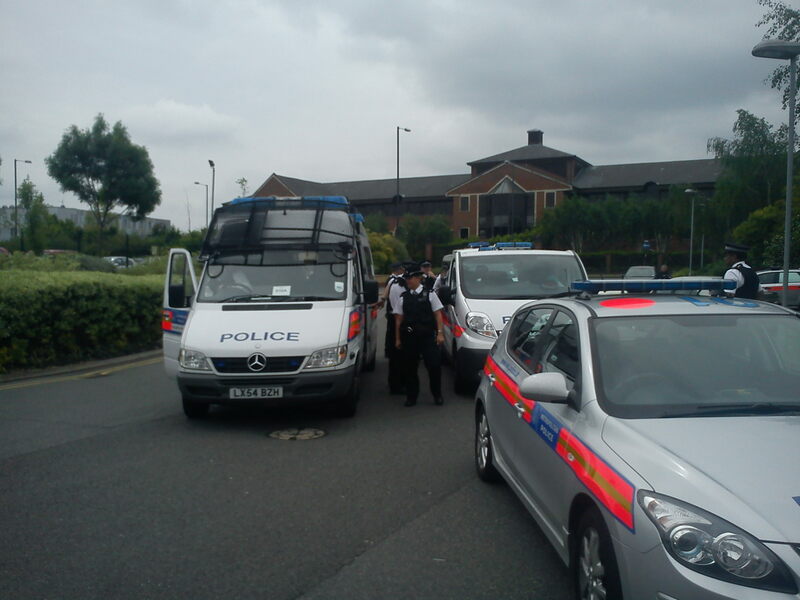 A defiant protest by supporters of Tamil refugees outside Colnbrook Immigration Removal Centre (IRC) yesterday morning delayed the departure of an airport-bound deportation bus, but ended with 4 arrests. Their action provided extra time for Barristers to win injunctions from the High Court, which cancelled the deportation of about 40 people. One gentleman was already seated aboard the aircraft with the engine running when news came through that his removal was stayed. When the first coach tried to exit Colnbrook at 11 am, supporters spontaneously ran out in front of the coach in protest at the deportation. Several people sat in the road and the coach driver turned off the engine. 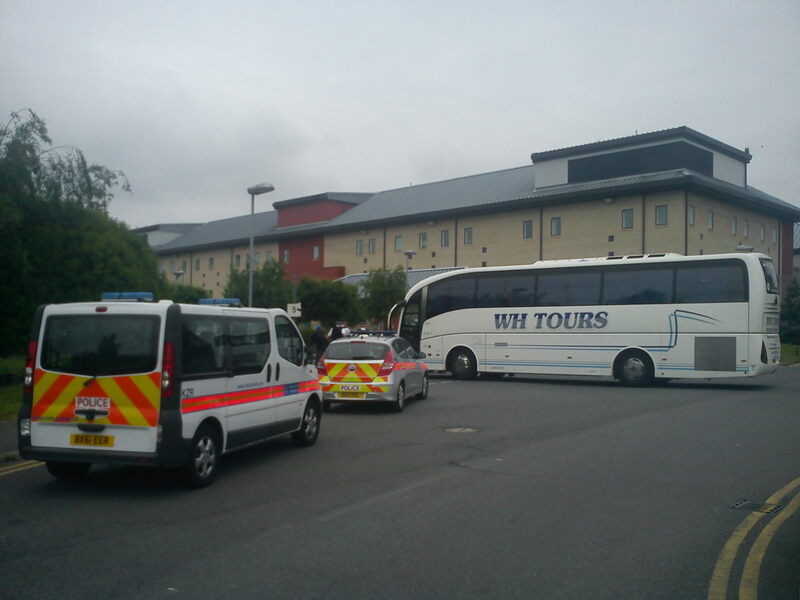 The second coach was able to exit the detention centre. Security staff and police were challenged about their awareness of the human rights situation in Sri Lanka – protestors brandished copies of Freedom From Torture’s report into ongoing torture in Sri Lanka and asked them if they had watched Channel 4’s ‘Killing Fields’ documentary, which none of them had. Protestors also reminded the most senior police officer at the scene, Inspector Qasim, of Britain’s obligations under Article 3 of the UN Convention Against Torture (“No State Party shall expel, return (“refouler”) or extradite a person to another State where there are substantial grounds for believing that he would be in danger of being subjected to torture”). More police were called to the scene, including a dog unit and a firearms officer, in what felt like an attempt to intimidate the small group of a dozen supporters. The police did not facilitate freedom of assembly and expression under Articles 10 and 11 of the European Convention on Human Rights, instead they decided to stop people from protesting at 11.30 am. Police forcibly cleared protestors from the road, without making it clear what section of the Public Order Act they were enforcing. 2 protestors were aggressively handcuffed, and another 2 by-standers were randomly placed under arrest. 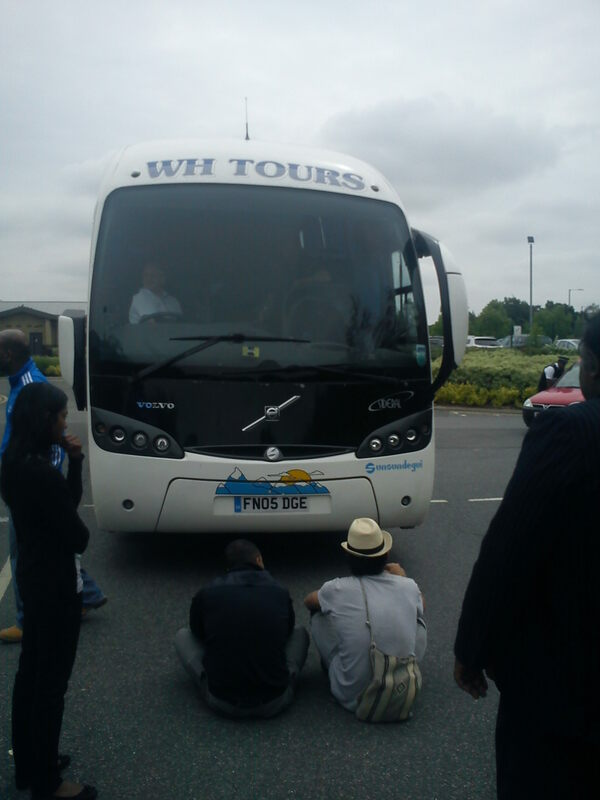 The coach then left for the airport, and the arrested protestors were taken to West Drayton Police Station. They were held in custody for almost 12 hours before being released: 2 without charge, 2 on minor charges. This 30-minute delay may have been crucial for Barristers to win injunctions in the British High Court of Justice which prevent many people from being deported. Mr Justice Eady seemed to vindicate the protestors with his ruling that “the recent Human Rights Watch report, dated 29.05.2012 suggests that there may be new evidence relevant to the risk of ill treatment”. Channel 4 explained that: “The Human Rights Watch report in question called on the government to suspend the planned deportations in light of 13 cases it had documented of failed Tamil asylum seekers being tortured by the security forces on return to Sri Lanka, most recently in February this year”. Yesterday’s flight was the fifth British government charter flight to Sri Lanka since June last year. Sources at Colombo Airport claim that 36 people were deported (22 Tamils,8 Sinhaleese and 6 Muslims), accompanied by 72 British officials, and interviewed on arrival by the notorious Sri Lankan C.I.D. 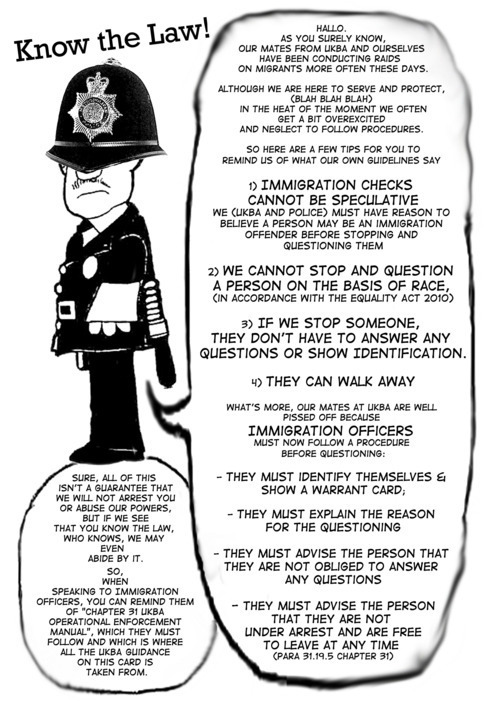 It is standard practice for the UK Border Agency to employ at least 2 private security guards from the firm ‘Reliance’ for each deportee. There are more videos of yesterdays protest which will be published at some point.